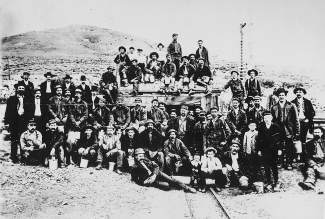 Miners in the boom time at Bodie, Calif. circa 1880 â photographer unknown. So said a San Jose tot the night before her family moved to notorious gold town Bodie. Called “the Wickedest Sin Town of the West” by a late 1800s preacher, Bodie is the topic of local author Marguerite Sprague’s talk at “Evening by the Creek” at the Kings Beach Library Saturday, Aug. 9, starting at 6 p.m.
Sprague went back to original sources and interviewed living Bodieites for her book, “Bodie’s Gold: Tall Tales and True History from a California Mining Town,” published by University of Nevada Press. “Bodie’s Gold” describes the social history of California’s Official Gold Rush Ghost Town, from the pre-contact Kuzedika Indian days through the gold town boom time and the town’s survival into the 20th century, supported by a few small but steady mines. What remained of the town became a state park in 1964. Sprague, program coordinator for the Tahoe Public Art Program with North Tahoe Arts, interviewed several Bodieites who grew up in small-town Bodie, including her own uncle who spent boyhood summers in Bodie with his gold miner uncle. During her research, Sprague debunked a few popular myths about Bodie and uncovered several obscure facts as well. Some truly bizarre incidents and people who had never been documented — like the peculiar Dr. Blackwood, who one night began digging a mine in the center of Bodie’s busiest intersection — appear in her book. Author Mary Jo Sonntag, author of “Write, If You Live to Get There,” will also share stories about her book (visit http://www.tahoedailytribune.com, keyword Sonntag, for more information). You are invited to take a picnic, bug repellent and warm clothing as the event is outside near the creek. The event runs 6-7:30 p.m. The authors’ books will be available for purchase. Lemonade and cookies will be provided at the Kings Beach Library, 301 Secline St., Kings Beach. Call 530-546-2021 for more information.